She told me that she wanted to run last year, when she was three. Girls in tutus, sweaty, hair streaked with bright paint: she wanted to be out there with them, not just on the porch cheering them on. I'd said maybe. She has always been athletic, even in utero. It wasn't completely out of the question. I run the route with her in the mornings sometimes, because it's a do-able distance for me in half an hour before I have to get ready to go to work. She and I talk about important things while she's in the jogging stroller cockpit, sucking yogurt and observing the road for me: the birds, potholes, school, friends, the nature of God. My husband registered her for the race with more faith than I had. She didn't train for it at all. It was going to be a hot, humid day. She tends to be somewhat last-minute about her bathroom plans; she is, after all, only four and a half. We talked about how it was a race, but that everyone who tries to get to the finish still wins. That she would win. We talked about how it was OK to listen to your body, to run when you felt like running, to walk when you felt like walking, and to ask to stop when you needed to stop. That if it started to rain, we were going to just keep going, because we could always dry off at home. She explained all of this to other people when she was telling them about her upcoming event, so it seemed to sink in. I promised her than no matter what happened, I'd be there right at her side. That we'd run the race together. On Sunday, before we locked the door to head downtown, I asked her several times if she wanted me to bring the jogging stroller, just in case. She declined, every time, finally getting impatient with me and telling me to stop asking. Which I did. She also declined the offer of a water bottle, which was unusual; water is her favorite treat. I worried about this a little more than the lack of a stroller, but I respected her wishes. 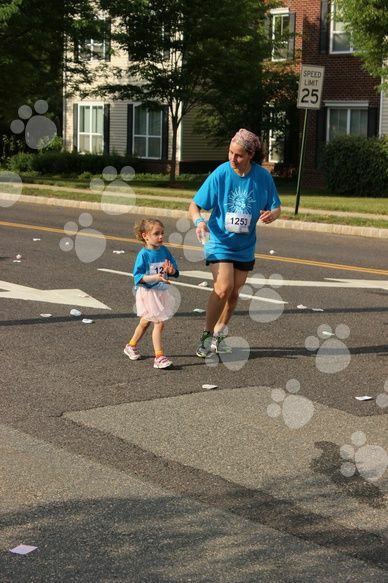 She was probably the smallest runner, though not by much. Her shirt, a youth size M, dangled to her knees. I tucked it into her pink shorts as best I could, and we pulled out her ballet skirt. I tried to swallow the lump in my throat, knowing at once that this might be one of those defining moments for her, and that she would probably surprise me. The first wave of runners left, and she jogged forward, dancing to the music at the start line. And then: "here we go!" I said. Beaming, she took off. She probably jogged for a good half mile before she walked a little, then jogged and walked alternately for another mile to the first water stop. She was doing great, I told her. Everyone cheered for her as she went past; I think she enjoyed the celebrity. Then: the hill. Hot. She complained that she was sweaty. I agreed, telling her that I was sweaty, too. That being sweaty is how this experience works. I fed her ice chips from the water table, but I could see her face turning red. A few hundred feet behind us, I could see the police car following the last runners. I'd never finished last before, and it surprised me that the prospect of finishing last didn't bother me so much, but I wanted to get her home before she got too hot or had to pee. I hoisted her onto my shoulders, and we ran another mile. I told her that I'd carry her to the next water station, that she could walk from there to the end. Down our street. Where everyone knew her. We jogged along, a mother-daughter totem pole, making a beeline for the hoses that people aimed into the air to cool off the runners. Finally I put her down, as I promised, and told her that it was all down hill from here, that we'd run together to the finish. A few yards down, she told me she was tired and wanted to go home. I told her to hold my hand, that we were so close to the finish. That maybe there was juice at the finish line. This motivated her some, and she sprinted ahead for ten more yards or so, her spindly little legs shooting out from under her tutu like the cartoon Road Runner's. We looked for more hoses. We said hello to friends. We made faces at each other. Finally, we rounded the corner. I could see the finish line in front of us. I urged her on, and she made a face that looked exactly like a runner in agony at the end of a marathon. I told her she could do it. That I'd give her as much juice as she wanted. She studied her medal as we wandered through the crowd, looking for juice. There wasn't any; we were too late even for the post-race bananas. "I don't think I'm going to run this race next year," she told me. "Why?" I asked, hoisting her back up to carry her home. "Because I get too tired at the end." I laughed. "I get tired, too, love. But you know what? I bet if you practice, soon you'll be able to run this race without getting tired. Soon, you'll run this race faster than I could." She thought about this. I could feel her chin resting on the top of my head, her body drooping. "Well, maybe next year." I smiled. The streets were mostly cleared of runners and families, who had collected their gear and gone home. "And in the meantime," I told her, "as long as you want to, we'll run it together." What I didn't tell her was that she's already my pacer. *for the record, she crossed the finish line one second before I did. For more information about Girls on the Run, visit http://www.girlsontherun.org/.